Interreg Europe organises a two-hour online event dedicated to networking, partner search and information about its new call for project proposals. 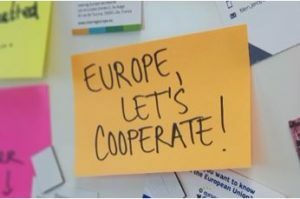 The event “Europe, let’s cooperate!” will take place on Friday 13 April at 10am and will be fully online, streamed live on the #europecooperates website as well as on its Facebook channel. have a chance to network, find partners and share inspiration in an online chat. Participants will also be able to share their ideas and send questions before the event with online chat rooms that will be opened on Wednesday 11 April. Interreg Europe is a program managed by the European Regional Development Fund (ERDF) for 2014-2020. The program helps regional and local governments across Europe to develop and deliver better investment, innovation and implementation. To know more about the online event, please read Interreg Europe news. To know more on Interreg fourth call for project proposals, please read our web-news and Interreg announcement.